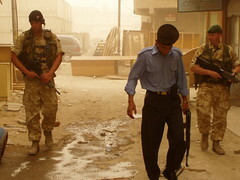 After three years of training by coalition forces and nonstop combat with insurgents Iraqi army and police units are battle-hardened, highly motivated and skilled in battlefield drills. At the tactical level ... we're doing quite well, says Lieutenant General Martin Dempsey, a senior official in the coalition training organization. Theyre fighting, dying, being wounded, being moved around country. He says 5,300 Iraqi soldiers from outside of Baghdad have been brought in for the surge. That last point their ability to deploy is a sure sign that Iraqi army units are improving. Battalions disintegrated last year when we tried to move them around. Now we have them ready to move, says Major General William Caldwell, top commander in Iraq. That was not even possible six months ago, Dempsey points out. Even the troubled Iraqi police suspected by many of having been infiltrated by extremist militias are apparently getting much better. Police trainer Brigadier General David Phillips says the police are much more professional now that systems are in place to punish corruption. Despite these improvements, leadership remains a major failing for Iraqi forces both at the national level and at the level of non-commissioned officers on the battlefield. Iraqs highest military leaders, including government ministers, and police and army officers still need babysitting by U.S. and other coalition mentors. "The higher up in echelons in command you go, the more vulnerabilities in leadership become evident," Dempsey says. "Most of the senior leaders are from the old regime and old habits die hard," he adds. There was a tendency to dramatically oversimplify things not much attention to detail. Thats a problem Dempsey is working hard to remedy. We've run numerous command and control exercises the ministers [of the Interior and Defense Departments] themselves participate. Now they appreciate the details." U.S. Ambassador to Iraq Daniel Speckhard says that ongoing surge operations in Baghdad have forced the ministers to learn quickly. In the past, he says, ministry leaders focused solely on strictly military solutions to security problems. Thats changing: recently the government formed defense planning committees focused on using diplomacy, reconstruction and other soft power functions to resolve conflict. Still, Speckhard is skeptical. Its too early to draw conclusions that there are encouraging signs of long-term improvement. Plus, the relentless demands of day-to-day combat have prevented the slow, steady training necessary to build up an experienced NCO corps, according to Dempsey. They would like to have a U.S.-style NCO corps, but they realize its a long way off. The Iraqi army NCO corps is growing, but there is a shortage of NCOs in the training establishment because every soldier is needed at the front and this has a detrimental effect on the security forces ability to sustain improvements in training and development. Dempsey says the coalitions plan for training Iraqi NCOs is evolving to ensure that enough non-coms remain in the training base.